Transmission Repairs and Rebuilding CAN be very expensive, sometimes several $1,000’s. HOWEVER, there are many minor causes of transmission problems that might scare you needlessly. Here are just a few that we have seen that could be at the root of your transmission or shifting problem. Vacuum Lines that have come out or loose: When this happens usually, your transmission won’t shift at all. Of course, a non-shifting transmission can scare you, but if this is the cause, the cure is not painful at all. Transmission problems due to prolonged bad fluid often results in major damage. The purpose of the transmission fluid is to protect the internal parts from damage by cooling and lubricating helping to keep it operating smoothly and efficiently. However, just like motor oil, transmission fluid breaks down with time and use. Once transmission fluid loses its properties to protect the inside of the transmission, your transmission degrades quickly. Usually when you have transmission problems due to neglected fluid, the problem is severe and expensive to repair. That is why it is less expensive to perform periodic Transmission Flushes. Because seals start to harden inside, this causes delays going into gear, shifting issues, and eventually (or sometimes suddenly) complete internal transmission breakdown. What is needed is to completely flush out the old fluid from the transmission, then replace it with the right fluid and top it off with a transmission fluid additive that adds extra protection. The way we usually do this is by adding a special flushing fluid that increases the temperature of the fluid. This helps suspend contaminants that are adhering to the walls of the transmission. Just as with your engine’s oil change, the oil filter needs to be changed. Not changing the filter or cleaning the screen can reduce your transmission fluid flow and increase temperatures quickly. Also, by performing a visual inspection inside the oil pan, we have the ability to catch major problems before they occur, potentially saving customer’s thousands of dollars. Avoid Jackrabbit Starts — Hard accelerations create a lot of friction and heat in the transmission. Take it easyon the gas and your transmission will live longer. Help the Shift — Most of the friction and wear in the transmission takes place during the shifts. 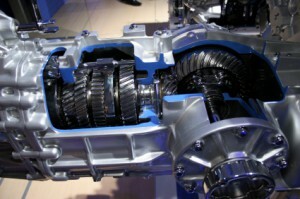 Get to know when your transmission shifts normally. Then, just before the shift, back off on the gas just a bit. That’llreduce the load on the interior components, and eliminate much of the friction during the shift. Keep the Cooling System in Good Shape — Most car’s radiator also provides cooling for your transmission.And heat damage will take place in the transmission long before the engine appears to overheat. So regularcooling system service can help your transmission run cooler… and last longer. Add an external Transmission Cooler — If you travel a lot in extremely high temperatures or carry a lot of weight inyour car, an auxiliary transmission cooler is a great way to reduce heat and add years to your transmission’slife. Camarillo Car Care is your best solution for transmission service and repair for Camarillo. If you live or work in Camarillo or surrounding areas, you’re lucky. Camarillo Car Care is an established AAA Approved Auto Repair shop for over 23 years. The company employs all ASE Certified Technicians, some of the best in the area. The company is the only ASE Blue Seal of Excellence Repair Facility in Camarillo. We have strong alliances with transmission vendors and this allows us to give you a variety of great choices for Transmission Rebuilding, Re-manufacturing or Repairs.